The emperor Septimus Severus decided that the Jewish and Christian religions must be curtailed if Rome was truly to rule and command the masses it lorded over. There was no room for any other lord within the iron grip of the Roman empire and Septimus Severus had finally decided on one very specific way to put an end to non-Roman allegiance: outlaw conversion upon penalty of death. To further strengthen the decree he made it retroactive a number of months. 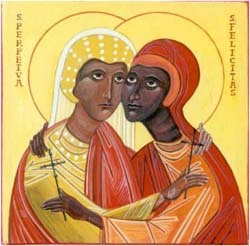 Perpetua and her servant Felicitas were recent converts and they were caught up in the chaos of legalized death and persecution. Before the authorities could seize them, they were baptized by the priests of their congregation even as they knew this was signing their own arrest warrant.Theyalong with a few others were arrested and imprisoned for the crime of their faith. Perpetua had just given birth to a baby boy and Felicitas was nearly eight months pregnant when they were imprisoned.